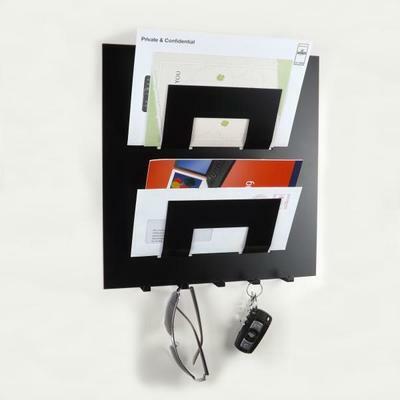 If you have a need for storage in the home or office, this high quality metal letter rack in black will compliment any environment. Its compact but practical design has the storage solution everybody has been trying to find. The 2 letter holders can accommodate various size letters in its stylish compartments. The 5 key hooks make easy access to the household or office keys. Manufactured in Steel and Powder Coated. Dimensions 33cm x 33cm x 7cm deep. Supplied with Fixings.